Why Is Health Care So Much More Expensive Than It Used To Be? I would add two points about the chart. 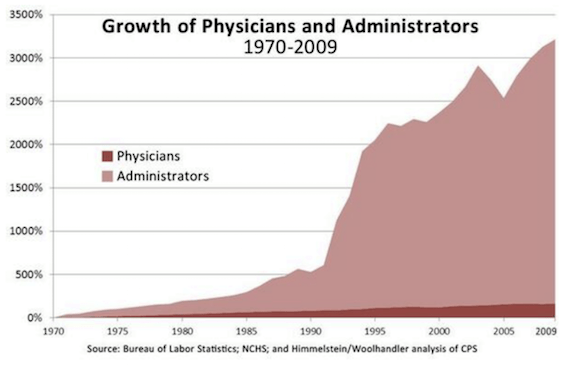 First, the increased cost of health care obviously has something to do with the metastasizing administrators. But it also is caused, in part, by an insufficient supply of doctors. Second, I have no doubt that you could create a similar chart for colleges and universities, with professors graphed against administrators–and for the same reason. Colleges and universities, like clinics and hospitals, spend a ridiculous amount of time complying with government regulations.